As their colleagues were enjoying holidays at home, more than 600 students drawn from different colleges and high schools gathered early this week at Gayaza High School on the farm. Some were seen watering vegetables, others checking on nursery beds, while the rest were on fodder farm attending to dairy animals. 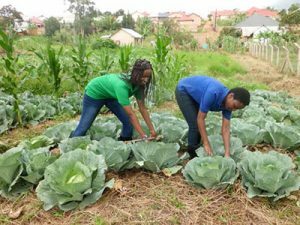 Every year there is a farm camp organised for secondary school children across the country at Gayaza High School in a bid to impart innovative agriculture skills in the children. This year’s camp which ended on Thursday attracted students from schools such as St Peter’s College Tororo, Marry Hill, Nyakasura, and Our Lady of Good Council among others.